The National Parks and Wildlife Act 1974 (NSW) that currently governs Aboriginal cultural heritage issues is outdated and inadequate, passed by a parliament four decades ago. Under the current Act, Aboriginal cultural heritage is protected by impact permits issued by the Chief Executive of the National Parks and Wildlife Service, and his/her power to grant or decline an application for such permit is widely discretionary. Aboriginal communities are rarely significantly involved in this process, despite the existence of an advisory committee. The NSW government proposes an amendment to Aboriginal cultural heritage laws that would improve the current National Parks and Wildlife Act. This amendment is a step in the right direction of recognition and protection for Aboriginal cultural heritage. However, while this Bill proposes to increase Aboriginal community involvement in Aboriginal cultural heritage issues, meaningful participation by Aboriginal peoples and communities is still restricted. We are concerned about the limited extent of Aboriginal community’s involvement during the consultation period of this draft legislation. It is questionable whether the eight-week consultation period provided sufficient time and opportunity for the Aboriginal peoples and communities to voice their concerns. The Bill also contains little information about potential resourcing of a new Aboriginal body, which is key to this legislation. Aboriginal peoples should hold the legal right to their intangible Aboriginal cultural heritage, as per Article 31(1) of the UN Declaration of the Rights of Indigenous Peoples. The proposed legislation establishes a registration system for cultural heritage, even for intangible heritage such as traditional knowledge and traditional cultural expressions. This registration system is fundamentally quite problematic as the right to maintain, control, protect and develop cultural heritage should be vested in the Aboriginal community where such heritage is from. A registration system takes away an inherent right held by Aboriginal peoples, and the worthiness to protect one’s cultural heritage should not be determined by whether it is registered or not. Although this Bill proposes to establish Aboriginal institutions, the Minister responsible still has absolute discretion in declaring whether something is Aboriginal cultural heritage. We believe the responsibility and authority to manage affairs concerning Aboriginal cultural heritage should sit with Aboriginal communities. Community Legal Centres NSW made eight key recommendations detailed below. Before the Bill is presented to parliament, further consultation with Aboriginal people be undertaken and details be provided about the resourcing of new Aboriginal bodies. The Bill should be amended to protect ownership of intangible Aboriginal cultural heritage. Current intellectual property laws should also be amended to reflect this. Intangible Aboriginal cultural heritage rights should be inherent; they should be automatically applied without need for registration. Section 36 should be expanded to include guidance on what is meant by 'not widely known'. 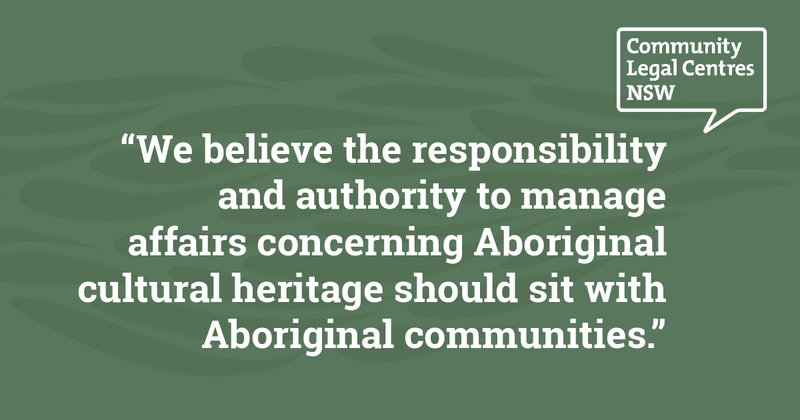 More decisions should be made by the new Aboriginal Cultural Heritage Authority. Failing that, there should be binding criteria for the Minister to consider when declaring Aboriginal Cultural Heritage. To ensure culture safety, the Bill should require the creation of management plans that safeguard the sensitive nature of disclosing Indigenous Cultural Intellectual Property. Amend Schedule 1 of the Bill so that there are binding criteria for the Minister to consider when removing a member from office. Amend the Bill to ensure Aboriginal community engagement at all levels of decision making, particularly where major development proposals are concerned; and ensure that Major Projects are subject to management plans and the harm offences in the Bill.